"The author, in his journal year, does not pursue just the rare or exotic; he deliberately seeks out the everyday in nature, the abundant aliens as well as the familiar natives -- the pheasants and chickadees, fungi and chicories, that are the stuff of everyone's adventures in the woods and fields not far from home, wherever they live." "LEANING SYCAMORES unfolds its linked narratives according to a kind of felt pattern that (is) nothing more or less than the 'logic' of every true love story. And with writing like that, (appears) a river probably destined for a lasting connection with Jack Wennerstrom in our collective imaginations, just as we link Cape Cod with Henry Beston or the Sierra Nevada with John Muir." Jack Wennerstrom, a writer, teacher, and naturalist, was born in Evanston, Illinois in 1948. He received a B.A. in English from Lake Forest College in 1970, taught high-school English, Humanities, and World Literature, and wrote his first novel, THE WAYSIDE OF DREAMS, in 1978. In the ‘80s he re-embraced his childhood love of nature and began writing for outdoor and nature magazines, including Bird-Watcher’s Digest, where he became a Contributing Editor in 1990. 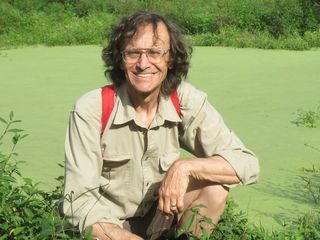 His first book, SOLDIERS DELIGHT JOURNAL, about a globally-rare prairie ecosystem near his home outside Baltimore, was published in 1995 by the University of Pittsburgh Press. This was followed by LEANING SYCAMORES: NATURAL WORLDS OF THE UPPER POTOMAC, published the next year by the Johns Hopkins University Press. While working as a teacher and naturalist at both Loyola University Maryland and BioTrek Naturalists, Inc., he wrote three novels: BLACK COFFEE, HOME GROUND, and PHEASANT ALLEY. He was President of BioTrek Naturalists from 2002 to 2006. Praise for LEANING SYCAMORES was equally high, with The Sun and Washington Post Book World offering kudos, and Pennsylvania Audubon’s Dave Bonta saying about it: “Every once in a blue moon a book comes along that’s so good a book reviewer can’t find the right words to praise it…” Said Carolyn Sutterfield of Mid-Atlantic Country: “Wennerstrom has a gift for the striking observation (and his) approach to his subject is refreshingly original, sometimes even disconcerting.” In 1996 LEANING SYCAMORES was nominated for The John Burroughs Medal, the highest award granted for a popular book in the natural sciences. Having left Chicago for the Mid-Atlantic region in 1976, Wennerstrom married journalist and editor Donna Shoemaker in 1977, in Dolgellau, Wales, U.K., and for the last 32 years has lived with her on a two-acre woodlot in Randallstown, Maryland, surrounded by trees, gardens, and wildlife. The first printing of SOLDIERS DELIGHT JOURNAL REVISITED: A PHOTOGRAPHIC RAMBLE has sold out. Please see the Photos/News page for more details about the book and its availability, or visit the Non-Fiction page.